John Henry Bonebrake was born on February 25, 1909 on a farm just south of Philomath, Oregon. His father was a minister and teacher who became president of Philomath College, a small United Brethren College. Before coming to Philomath Dr. Bonebrake had served Campbell College and Lane University (now Westmar College, LeMars, Iowa) in a similar capacity. John always claimed his father could "do anything" and was his admired ideal. His mother, Charlotte Estella Shipley, was a student at the college and married the president. John's grandmother, a Henkle, crossed the plains to Philomath, Oregon on the Henkle wagon train. Faithful oxen pulled their prairie schooner to the foothills of Mary's Peak where the subsequent families were raised. John attended grade school at Hood River (West Barrett) where the family of ten moved. The four older boys had their specified chores on their apple orchard as their father traveled extensively at this time as Conference Superintendent for the United Brethren Church. Moving again, this time to Portland, John finished his grade school education at Woodlawn and graduated from Jefferson High School. Early in life he decided to be a metallurgist, but changed his mind in mid-high school to that of Mechanical Engineer. He is a graduate engineer in that field. His college schooling was at Oregon State University 1929-1934, followed by numerous specialty courses at University of Oregon Extension Center, Oregon Technical Institute and others. Together with his wife, Phyllis, they have, since before marriage consistently studied courses in several schools. Each has accumulated about 30 credits at Clark College, Vancouver, 12 credits each in Geology and Rocks and Minerals. Phyllis Greer and John were in the same high school but actually met at an Oregon State University function. They were married April 11, 1937 at Piedmont Presbyterian Church in Portland. They raised two daughters, one of whom, Jean Katherine Gatherer died during pregnancy in 1967. The youngest daughter, Beverly Rae is married to Kenneth W. Vernon, chemical engineer and patent attorney whose office is in Seattle, though they live in Auburn where their three children attend school. After formal training, John worked in a number of technical fields. One experience that established his interest in geology was employment in the engineering department of the International Smelting Company at Tooele, Utah, under his brother, a graduate mining engineer. In those days engineering employment was hard to find. He did engineering with Columbia Aircraft Company in Portland, became plant engineer at Timber Structures Company, Portland, and switched to heavy power plant contracting also in Portland. At the close of World War II he became an associate member of a local consulting engineering firm. 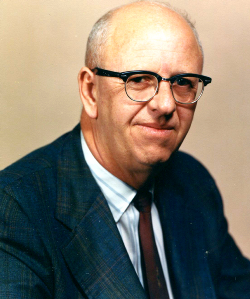 In 1952 he opened his own professional office as John H. Bonebrake, Consulting Engineer. His specialties are primarily large air conditioning systems, boiler plants, heating ventilating, piping, duct systems and sewerage design. Alaska has been one of John's main fields of operation for all of his consulting years. Included are hundreds of projects for the state, institutional, hospital, and governmental projects throughout most of Alaska. He has been a registered Professional Engineer since 1943, being registered in Oregon, Washington and Alaska. The drilling of many wells in Oregon, Washington, Idaho and Alaska by necessity created in him a great interest in geology. A number of wells, many in the Portland area were drilled entirely through the thick Columbia River basalt flow in search of tepidly warm water for heat pump projects. Others were drilled shallower for cold water, for domestic water, and for fire fighting purposes. His diversified work is his main hobby. He also likes to swing a hammer and saw. A weekly swim in the pool across the street is on his agenda, and an occasional game of golf. Another hobby, skiing, regrettably takes a back seat, though the whole family skiied for many years on the slopes of Mt. Hood. Hiking takes high priority, even the Chilkoot Trail of Alaska and many hunts in Alaska. The Bonebrakes are members of the Mock's Crest Evangelical Church and are registered Republicans. 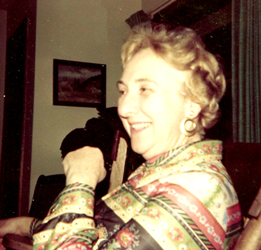 Opal Helfrich, a native Oregonian, was born in Portland on May 20, 1916 to William Everett and Lucy Elizabeth Jones. As a child she loved the outdoors and spent as much time as possible there, looking for the first wild flowers of spring, savoring the warm days of summer, admiring the colorful maples of autumn, and delighting in the quiet beauty of the new fallen snow of winter. As a student at Jefferson High School, she was active in Girl Scouts and represented that school on an all-city council. Upon graduation, she received a scholarship to Linfield College and later one to Oregon State College. She took courses through the Extension Service of the Department of Higher Education and at Portland State University. In addition she studied law for two years at Northwest College of Law, now a part of Lewis and Clark College. In 1947 she was president of Progressive Business Women's Club and is a charter member of that organization. Other memberships include the Native Plant Society of Oregon, Oregon Museum of Science and Industry and the Oregon Academy of Science. During World War II she worked for the Pullman Company, where she had charge of the sleeping car assignments on both troop and civilian trains. After this she was employed by the Internal Revenue Service where she ultimately became a tax technician in the Estate and Gift Tax Division, for nine years, she and her husband, Merle C. Helfrich, operated Parkrose Paint & Equipment Co. In 1972 they purchased Helfrich Equipment Co. in which they are both active. At the suggestion of her son, Jerry A. Vanderlinde, an Assistant Professor of Art at North Dakota State University at Fargo, Opal enrolled in Ralph Mason's course in geology at Portland State University. At Mr. Mason's invitation, Opal and Merle became members of the Geological Society of the Oregon Country. They also share a mutual interest in music, and enjoy playing piano duets together. They are members of the Oregon Symphony Society. Their other interests are gardening, traveling, hiking, and camping with their grandson Bill Vanderlinde. They also have another grandson, Orion who lives with his parents Jerry and Thuy Vanderlinde. Born - Aberdeen, Washington in 1912. Married - Geneva Lyons in 1945. Children - Steven in 1947, Janet in 1949. Grandchildren--three plus. Hobbies - Hiking, photography, and the natural sciences. in 1930, while hiking the Skyline Trail for the second time, I wanted to learn more about the mountains, Crater Lake and the beauty of the scenery. In 1971, we joined the Geological Society of the Oregon Country, In addition to GSOC, I am a member of the Oregon Museum of Science and Industry, Society of Miscellaneous Oregon Scientists, the Oregon Academy of Science, and the native Plant Society of Oregon. Robert Waiste, Jr., was born in Portland, Oregon, March I5, 1921, the son of the Late Robert A. and Lorna Fisher Waiste. 1978 - ROBERT wAISTE, JR. Occupation: With Corps of Engineers, Portland District, October 194l to retirement February 26, 1977 from position as Chief, Office of Administrative Services. Military Service: U. S, Army, 22 August 1942 to 6 February 1946. Joined GSOC in 1960’s. Have taken geology courses sponsored by the Society. Reside with wife, Dorothy, at 133 SE 27th Avenue, Portland, Ore., 97214. William MacRitchie Freer was born at the foot of Mt. Mayon, (pronounced 'My own'), on the Bicol Peninsula of Luzon in the Philippine Islands on February 26, 1907. Mt. Mayon is a favorite text book example of a perfect cinder cone, and most of the membership have seen pictures of it in texts they have perused. It rises 8,000 feet above sea level at Legaspy, and being, I believe, the highest point of land in Luzon, it is a favorite landfall for mariners in that part of the globe. It is an active volcano. Reason for my being born at this improbable spot was that my father was one of the first American educators to go to the Islands after the war - the Spanish American War, that is - to organize the American school system there. Subsequently I Lived in Arizona, Oklahoma, Kansas, Ohio, and Michigan, but mostly in Oregon. I went to Lincoln High School here in Portland, and then to the Oregon Agricultural College - now Oregon State university. But before I could graduate, high adventure lured me to the Oregon woods scene where I lived in logging camps and built the railroads for sundry logging companies. In the summer of 1926 I helped locate the road around the rim of Crater Lake; in 1928 the Lewis River was my playground when the first aerial topographic map, in the Northwest was made there preliminary to the building of the dams. Later, I attached myself to the Portland District of the U.S. Army Corps of Engineers, for whom I made hydrographic surveys on the Columbia and Snake Rivers, some for navigation and others for studies for dam locations. These adventures were interrupted by World War II, when I found myself in the 29th Engineer Mapping Battalion, then stationed right here in Portland. The next four years found me field checking 15 minute quadrangles from Cape Flattery to the Mexican border. Back with the Portland District after the war I designed and produced the District's navigation and dredging charts, to which I added rectified photography. From 1962 to 1969 I was the President of Local No. 7 of the National Federation of Federal Employees. Consistent with the syndrome of my retarded childhood, I was married in 1965 to Kathryn Sins, Treasurer of Local No.7, who graciously pretended that I was quite normal. I joined the Geological Society in I960, impressed by the enthusiasm of Stilly Moltzner and Dwight and Daisy Henderson. Daisy was an old friend from Oklahoma Days. I retired from the Corps in 1972, and since then my principal interest has been trying to keep out of trouble — at which I am not very successful.